Sometimes we make fancy snacks for the Bows. 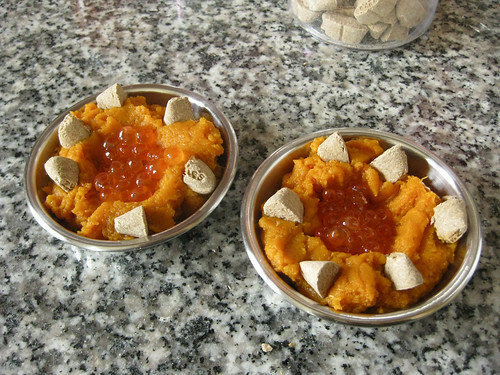 Here we have a little scoop of salmon roe (about a teaspoon) on a bed of pumpkin puree (a nice rounded tablespoon), accented with chunks of Zuke’s Turkey ‘n Taterz Mini Bakes (only three pieces on each, snapped into halves and arranged prettily). The dishes are small. They each fit in the palm of my hand. Both Bows enjoyed their snack very much.